Beyond the opulence of the Loire Valley castles lies a deep seeded history of feuds and craftsmanship alike. We have made a list of the chateaux you should see while spending your holidays in the Vendée. Why are there so many castles located in this area of France? What makes the Loire Valley so special? – The answer is not simple and spans many centuries. In an effort to be brief, we have boiled it down to three major reasons why the Loire Valley is an area of such great natural and cultural wealth. 1. The Loire river and its tributary branches mark a sort of natural barrier between the colder climate of northern France and the warmer climate of the south. The presence of the rivers cause the area to be a few degrees warmer, and provides irrigation. There is evidence of settlements dating back to the Stone Ages. Different types of soil make for a varied horticulture from asparagus and artichokes, to productive vineyards. Lastly, forests teeming with wildlife were a vast hunting ground. 2. A turbulent history of wars in the region fuels the reason for the castles further. Between the 10th and 12th Centuries, the territory was vied for by Lords and Counts who built feudal castles and fortifications. The Roman Empire had fallen, but a hierarchy of religious figures continued to unify the population against invaders. Let's not forget that the cultural heritage of the region also includes the presence of many abbeys, prieuries and enormous churches, a testament to the influence of Christianity here. For a period of time, the castles constructed at the start of the Middle Ages were abandoned. But the Hundred Years war (1337 - 1453) brought change. For five generations, the rulers of the Kingdom of England (House of Plantagenet) fought the French House of Valois over the right to rule of the Kingdom of France - the largest this side of Europe. Victories and defeats were had by both, but when Paris fell to the Anglo side, the King's son sought refuge in the Loire Valley and slowly the French seat of power shifted to this area. As such, the Loire Valley became a safe haven of the Kings. It is their very presence that marked the huge expansion of castles as the Kings were followed by their loyal constituents, the nobility, who bought and salvaged the neglected structures of bygone centuries, or built new ones. 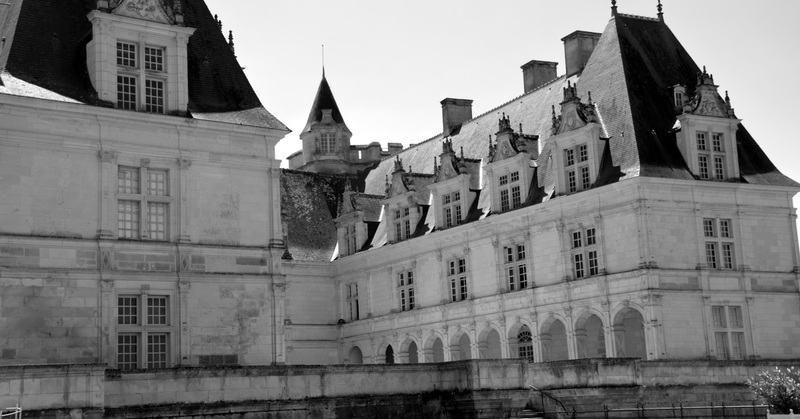 This coincided with the start of the Renaissance period during which the relationship between France and Italy (culminating in the marriage of Henry II to the famed Catherine de Medici) opened the door for the architectural influences we can still admire throughout the Loire Valley today. On the surface, the region became littered with "pleasure palaces" while actually the castles were strategically located for the purpose of the war between France and England. Interestingly, as the King and his entourage were constantly on the move, travelling from castle to castle, a King's bedroom was always kept at the ready in the case of a royal visit. These are still in evidence e.g. at Chateau d'Ussé and Chateau de Brissac. 3. The reason so many of the castles survived the destructive hands of the French Revolution, is simply because they were privately owned by the nobility. Some noble families were actually popular and respected among the peasants. 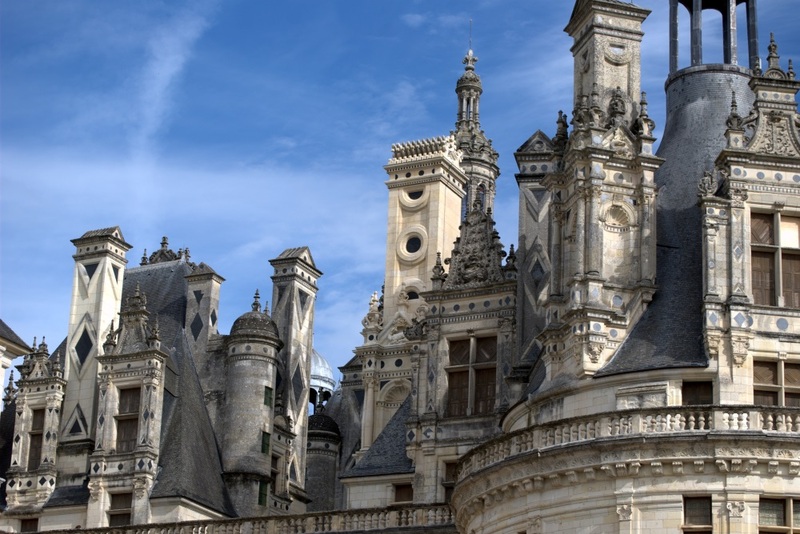 The content of many a chateau, such as Chambord, was saved by being sold or simply hauled away to other houses of the nobility so they might be protected. A great example of this are the pieces at the Chateau du Terre-Neuve in the Vendée, where several pieces rescued from Chateau de Chambord remain safe to this day. From the feudal castles, through the Renaissance, and the Age of Enlightenment, Lords, Kings and nobility built the impressive structures on the riverbanks of the Loire and its tributary rivers. Because of this, builders, architects, artists, and landscape architects like the famed André Le Nôtre (Versailles) were drawn to area. The chateaux of the Loire Valley are sometimes mind-blowing for their ingenuity, sometimes infuriating for their opulence and what they must have cost... but each and every one stands as an incredible testament to their creator's imaginations and artistic contributions. That is the gift they left behind for us to admire, so many centuries later. Route Planning, preparation – IMPORTANT: Check chateau websites before you go and plan accordingly! Budget: Count on €10 - €15 per chateau per person. 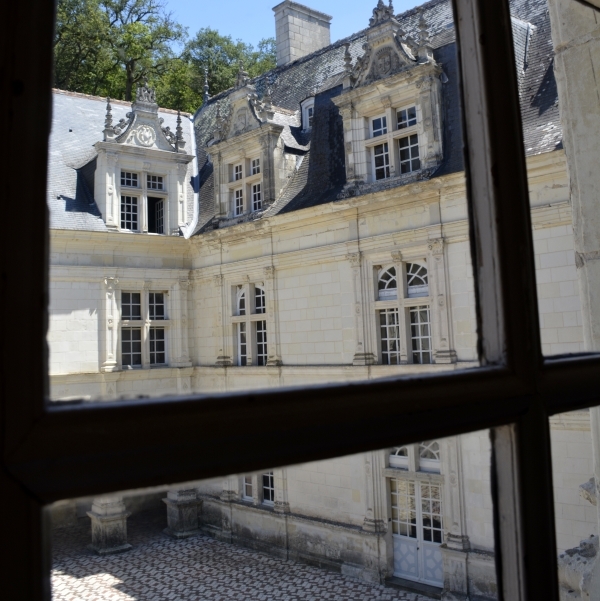 It is possible to purchase multi-chateaux passes, at the Loire Valley tourist offices e.g. in Tours but it's not likely to be for entry to the top ones. Also be aware that youngsters under 18 may have free entry. Tip: audio tours drive up the ticket price by around €3! Some locations are vigilant about cleaning the audio devices. Think of flu season! A great way to save money and to really enjoy the chateau grounds (not to mention people watching), is to avoid the on-site restaurants. Pack a lovely picnic instead. Parking: some charge (like Chambord) and some do not. Driving time: chances are you'll spend a couple of hours in the car, sometimes three. Do not let it deter you even if you're the only driver. The chateaux are worth every single moment of gazing at the rolling hills and river banks of the Loire Valley. And you can always insert a game of chateau-spotting along the way! Driving is the best way for budget and time management. Time Management: To make the day and driving time count, consider two or three sightseeing points along the route e.g. it is possible to see Chambord and Chenonceau in one day. Granted it's a very long day, but you'll love every second. Wine tasting: In addition to the castles, the Loire Valley is famous for its many splendid wineries. Do remember to take it easy if you decide to go wine-tasting along the route. Think about appointing one or two designated drivers. Alternative transportation: take the train to Tours and book an all-day tour. Anything is possible. You can even rent a scooter! Château d’Ussé fits the bill for our explanation as to why there are so many castles in the Loire Valley perfectly. It started its life as a fortified castle in the 11th Century, sold and rebuilt in the 15th Century. 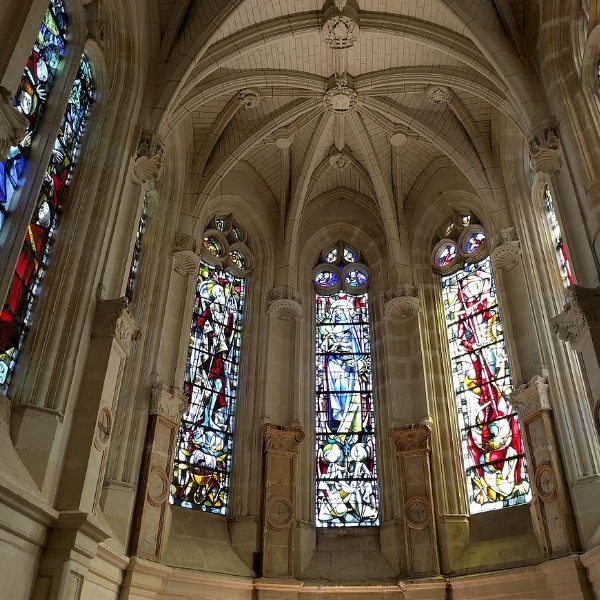 In the 16th Century, the beautiful chapel (Renaissance period) was added to it. The castle you see today is 16-17th Century. Its terrace gardens were designed by André Le Nôtre. Today the castle belongs to Casimir de Blacas d' Aulps the 7th Duke of Blacas, who lives here with his family. While half the castle is private, there is plenty to see. The interior is lovely, with stunning floors and ceilings. 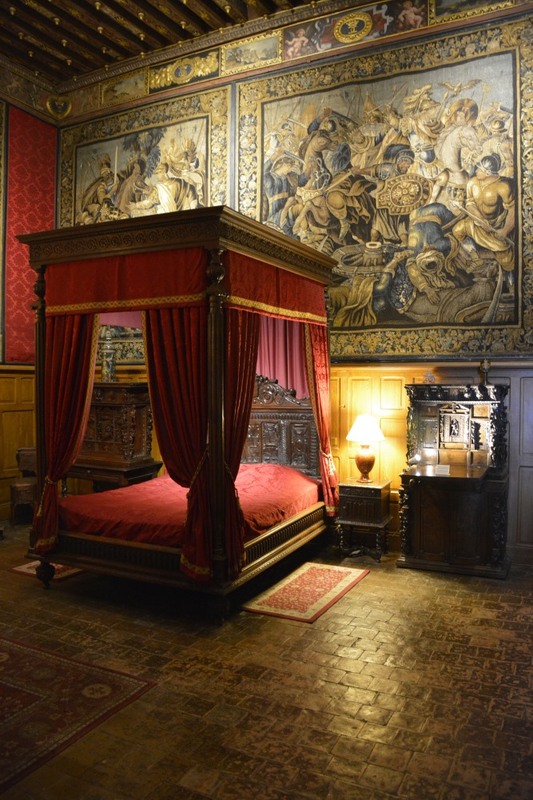 There are huge Flemish tapestries, and there is a King's bedroom. Unusually, you can see the attics with the children's bedrooms and where they received their schooling. It is said that Château d’Ussé and its romantic architecture was the inspiration for Sleeping Beauty. 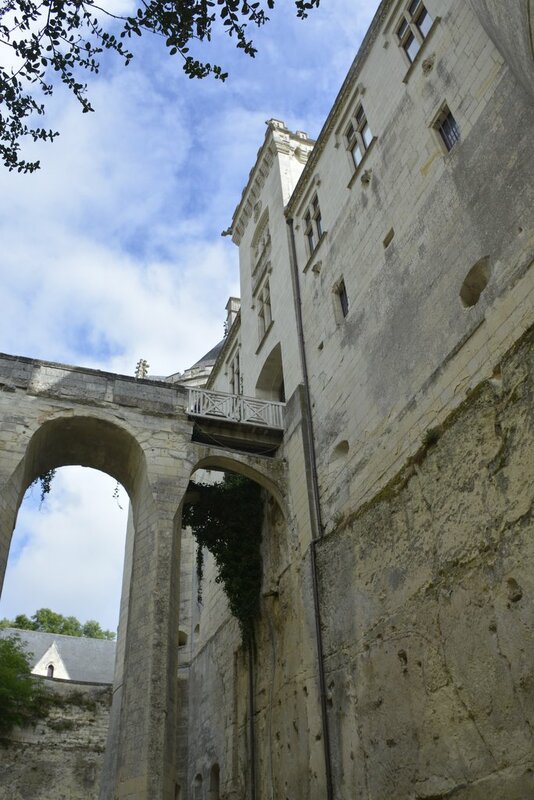 The fairy tale has been depicted in the self-guided chateau tour but don't expect Disney! The castle itself is well-maintained, but the Sleeping Beauty display could probably use an update. Combine with – Chateau de Villandry (20km). Also close to the city of Chinon, with its medieval fortified castle. Food – picnic spots, snack shack across from the castle, a restaurant in the tiny village. Wine Tasting – 14th century caves are open for viewing, no tasting on-site but plenty nearby! Château de Brissac became the tallest castle in France in the early 17th Century, but started its life as a fortified castle in the 11th Century. Its underground passage ways are view-able at the end of the guided tour. In between, the castle also saw a rebuild in the 15th Century. The facade shows a unique blend of its reconstructions, with the 17th Century Baroque style flanked by medieval towers. 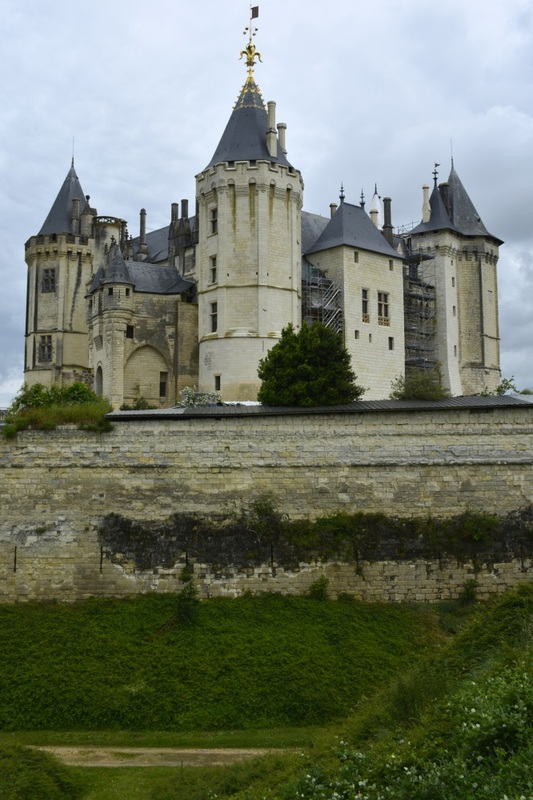 The castle has been in the possession of the Brissac family (French nobles) since 1502. The family take patrimony and restoration very seriously. 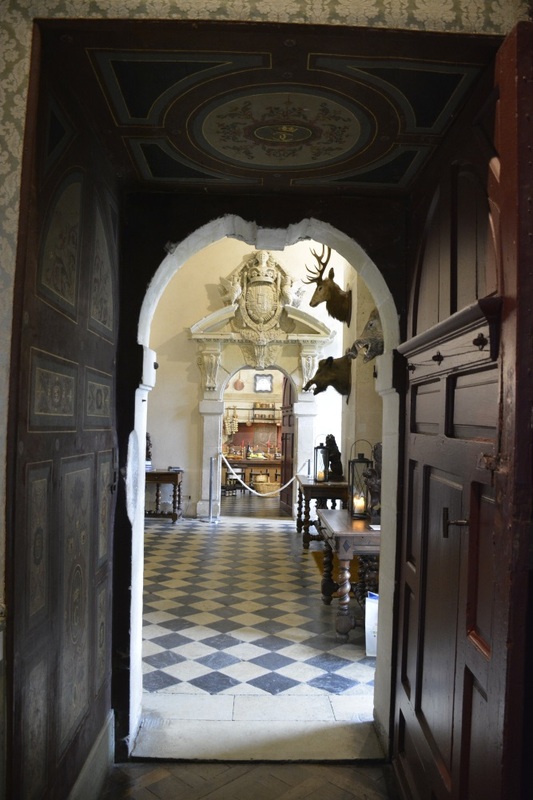 Upon entering for the guided tour, it is immediately apparent that the castle is their home. Of the 7 floors (204 rooms), only 4 are open to visitors, but what you’ll see presents top-level artistry and craftsmanship. Truely remarkable here are the handcrafted ceilings, which were restored at the end of the 19th Century, the newly refurbished theater (still used), the underground tunnel and cellars, and the truly remarkable bedchamber of King Louis XIII (father of Louis XIV) who stopped by for a visit in 1620. 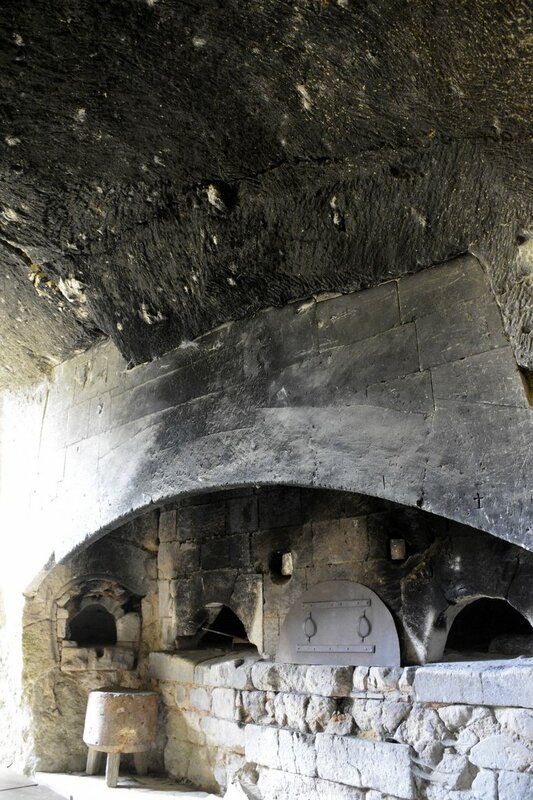 The medieval kitchen, accessible through the gift shop, is also beautifully preserved. Stunning gardens with ancient trees! 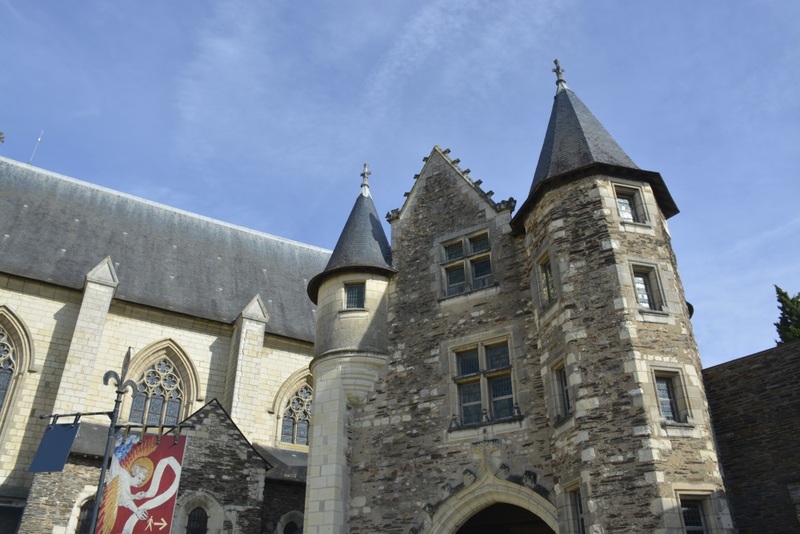 The 14th-century keep where King Philip II of France famously met with Richard I of England to discuss peace was beautifully preserved, with the current chateau built around it in the 16th century by its owner at the time, Jean Le Breton. The Le Breton family owned the castle for over two centuries but it was sold then, and fell victim to the French Revolution. 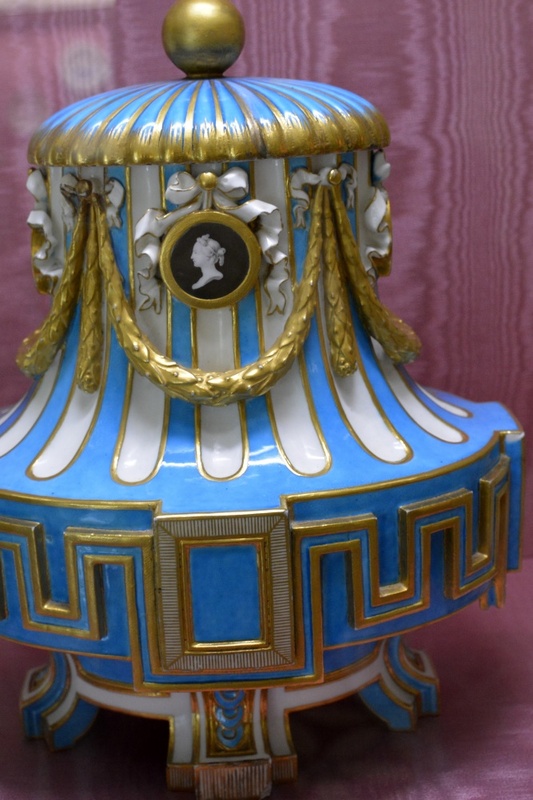 After its confiscation, Napoleon bought it for his brother. In the early 20th Century the chateau was purchased Joachim Carvello, a Spanish doctor of medicine, and Ann Coleman from Lebanon, Pennsylvania. They lived here with their four children, and restored the castle's facade and gardens to their Renaissance splendor. The castle is now owned by their great-grandson Enrique Carvello. The star of the show is -of course- the gardens which require a team of 14 people to maintain. The geometric patterns and lay-out are on stunning display from every window. 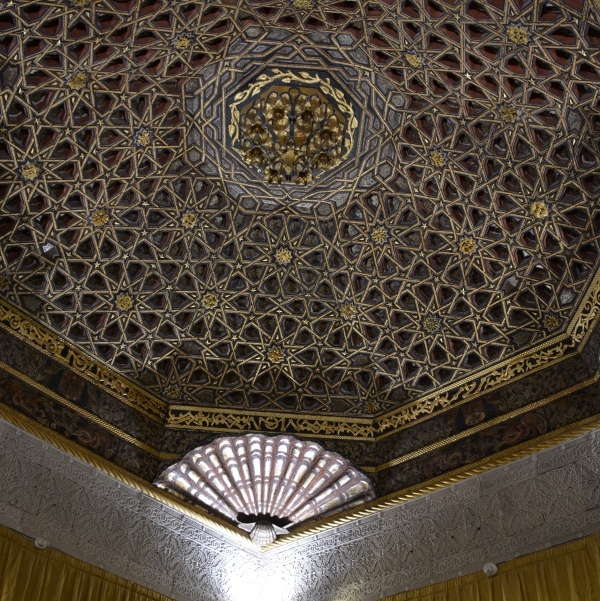 The ceiling in the oriental room might have you want to lie down on the floor, it is that astonishing! 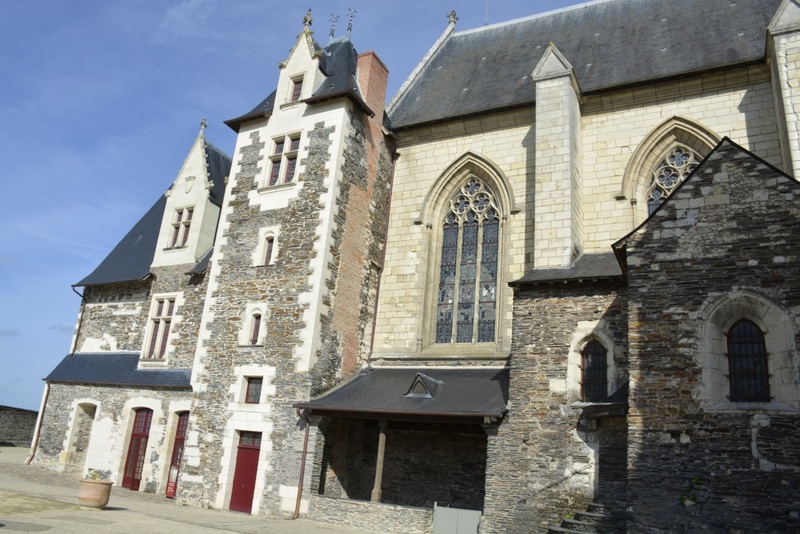 This cultural heritage site is exceptional among Loire valley castles. Its furniture gleams, its floors are polished, there is not a speck of dust or a cobweb to be seen. And the splendor of the gardens is brought indoors with the magical scent of fresh flowers in every room. Château de Villandry delivers the best of historic horticulture, architecture, and art. Joachim and Ann's 17th century Spanish art collection is on display as well as an exhibit of modern art in the attics of the chateau. Château de Brézé has been the most surprising to us (disclaimer: to date... we're always ready for an even bigger one!) For those of us who love adventure in the spirit of history THIS is THE ONE! Let's hurry through the most interesting of the above ground castle: the servants and servants of servants quarters, the bishop’s bedchamber, the intricately carved Neo-Gothic wood panels and furniture in the dining room... the chateau shows its history throughout the ages from the 11th Century to the 19th century and subsequent restorations. The family who owns the castle were the Grand Master of Ceremony to the Kings of France from 1701 to 1830. Over a century later, the castle was occupied by the Germans in WWII. Oh, if the cobblestones in the medieval drawbridge could talk! But let us dive off the drawbridge, into the deepest dry-moat in Europe for underneath the Renaissance-style Château de Brézé, lies the original castle, 12th-century trogloditic dwellings literally carved from the rocks. 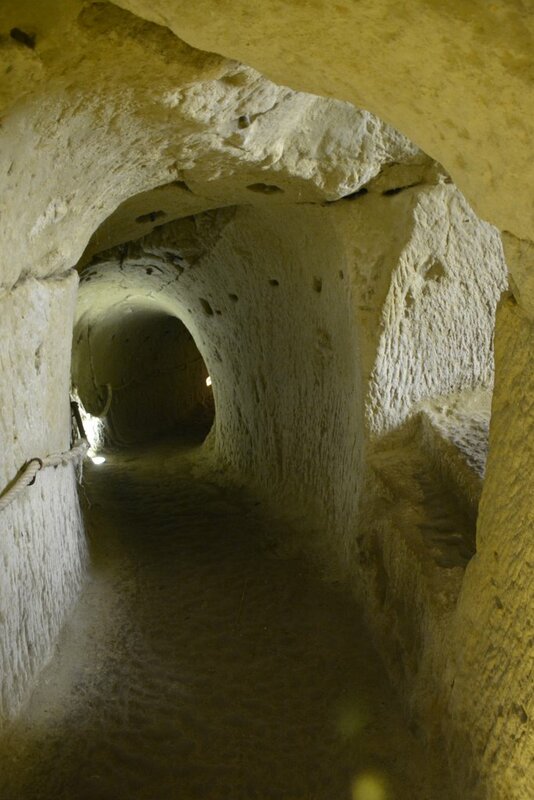 Over 1km of exploring awaits into deep underground chambers, the ancient kitchen and press rooms, and more. 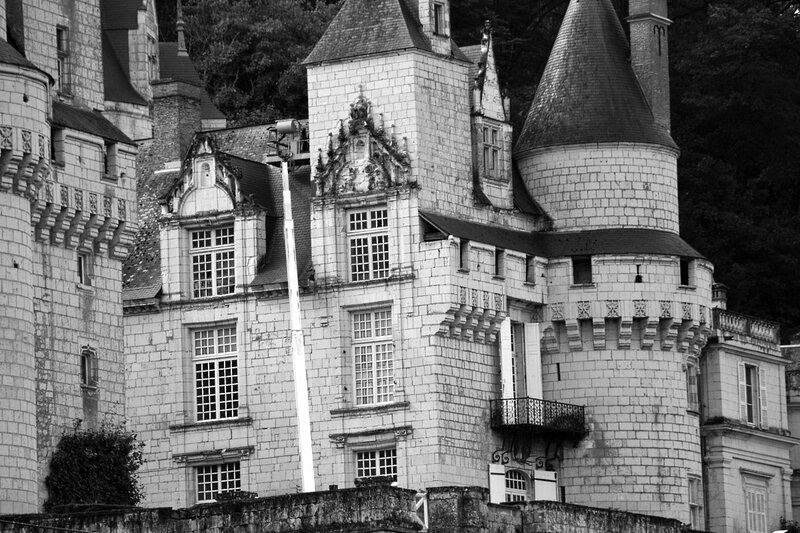 A visit to this chateau will send your adventurous spirit (and that of your children) into imagination overdrive. Elderly & disabled – Warning signs posted for people with heart/mobility issues. Not ideal for people who suffer severe claustrophobia. Children – superb! Bring a torch to shine a light on all the nooks and hidden places underground. Combine with – Chateau de Saumur. 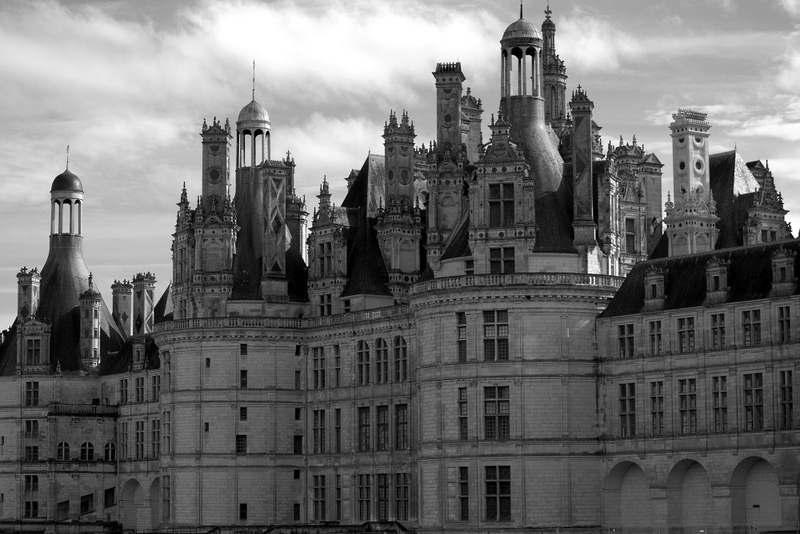 There's not a soul who couldn't agree that Chambord is the most stunning château in the Loire Valley. The main image included here depicts OUR very first view of the castle in 2008, long before the visitors center was built. We've been back since then, not surprisingly, because the castle leaves a lasting impression and yours truly will never not want to see it again. You simply should not miss it! We dare you not to exclaim a loud WOW upon first sight. The chateau was conceptualized by King Francois I as a symbol of power. It was constructed around the famous double helix staircase from which each floor is accessible. 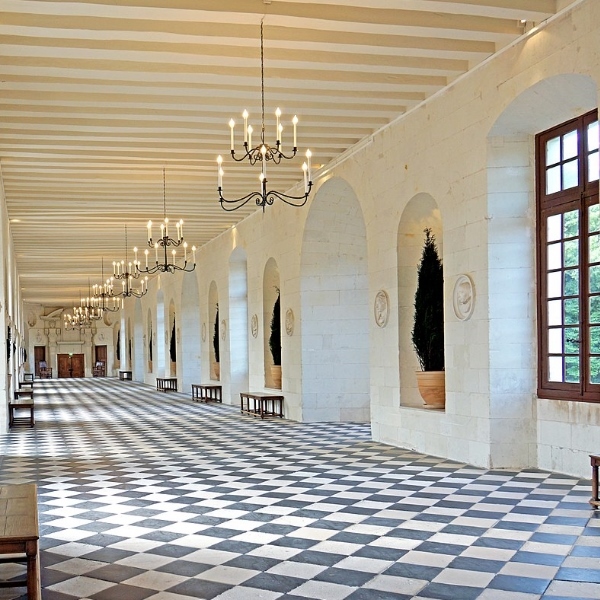 But it was King Louis XIV who completed construction, famously the considerable stables. The gardens are the latest restoration project here, further solidifying Chambord as a remarkable testament to the Renaissance period. 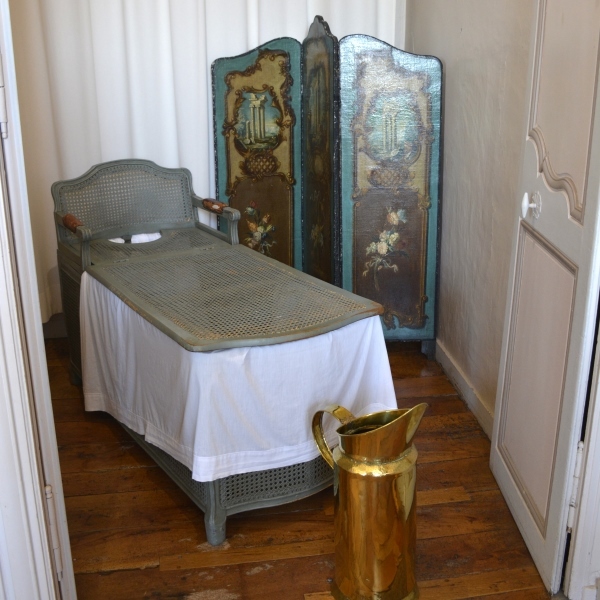 Furnishings are not from the period, as much of the chateau was dismantled in the Revolution so its treasures might be secured. The art and furniture collection is remarkable but it's the house itself that is the real treasure. Treat yourself and your family to a day of splendor. Adventurers, history connoisseurs, castle lovers, hikers, photography enthusiasts, and dreamers will find their stride here. No question. Elderly & disabled – everything has been thought of and provided from wheelchairs to electric carts. Guide-dogs allowed. Combine with – Chateau de Chenonceau OR BLOIS - which should also be on this list! The castle as we can admire it today is 16th Century with the main portion built between 1514–1522 on the foundations of an old mill that was part of the 15th Century chateau that stood here, but there is mention of an older structure as early as the 11th century. The bridge over the river was built (1556-1559) by architect Philibert de l'Orme, and the gallery on the bridge (1570–1576) by architect Jean Bullant. The home of Catherine de Medici changed hands many times and it has been modified since she lived there. But the castle is famous for having been envisioned, furnished, protected and preserved almost entirely by women throughout its history. The last king to visit was Louis XIVth in 1650. And Louise Dupin, a woman with famous salons in the Age of Enlightenment, saved it from being destroyed in the Revolution. In more recent history, the gallery across the river was used as a hospital ward during WWI, occupied by the Germans in WWII, and bombed by the allies in June 1944-which destroyed the chapel. 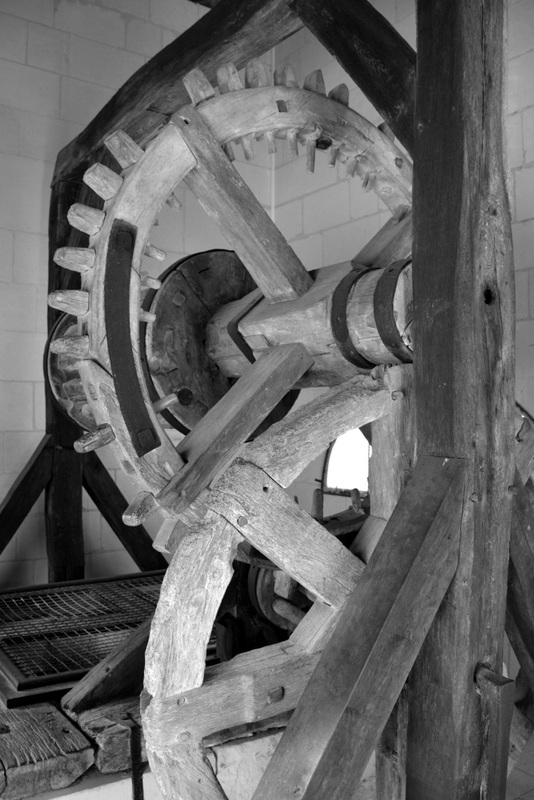 Chenonceau was classified as a historical monument in 1840, but it is owned since 1913 by the Menier family (formerly chocolate makers), who ensure its restoration and preservation. Elderly & disabled – walk from parking to castle; wheelchairs available for free. Access to chateau ground floor (with film of the rest). Guide dogs allowed. Small dogs OK in the house but must be carried. Dogs generally accepted on a lead. Children – there is a maze! Wine Tasting – No, but you're in the Sancerre area! This chateau began its life as a fortified stronghold 10th century by the Count of Blois in defense of the area against Norman invasions. In 1026 it came into the hands of the count of Anjou and his Plantagenet heirs. The castle was later rebuilt by Henry II of England, in the 12th century. But it changed hands again, becoming a French royal castle that was mainly used for military purposes. In 1621 the castle became an army barracks and after two more centuries, Napoleon made it a state prison. In 1862 the castle became a historic monument and has since seen several restorations. 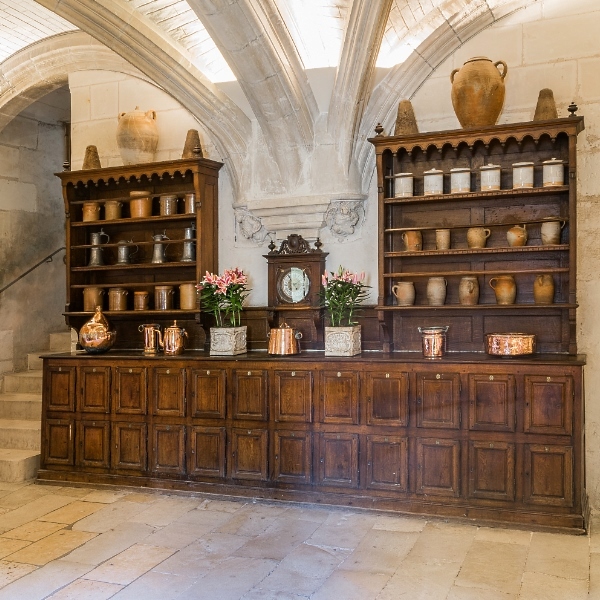 We found the large exhibits of ceramics (one of the most beautiful earthenware collections in France), tapestries, figurines etc to be truly remarkable here, and that is why this chateau made our list! An abbey is also there to visit. Elderly & disabled – pets not allowed. Many stairs. Special about this fortress is its size, with 17 towers and the building style of black and white rocks. On the outside it looks like a stronghold, and on the inside there is a blend of medieval and renaissance architecture. There is a vineyard atop the ramparts of the chateau and the chapel shows faded, but beautiful murals. But only some of the interior castle is open to the public, most of the visit is outside. We loved the archaeological display of a digging site where 3 cisterns (burial places) were found, as well as an underground chapel. 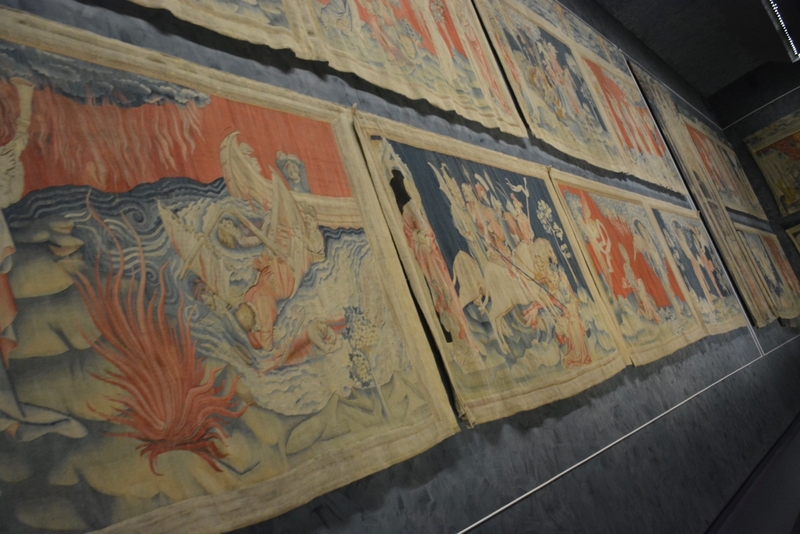 Both locations can be viewed from the pavilion where the Tapestry of the Apocalypse is displayed. Elderly & disabled – partially, and assistance dogs are welcome. Parking – in the city (free) but minimal city driving with parking at the railway station. From there it's an easy walk to the castle. Making the most of theVendéen proximity to the Loire Valley castles. Let's go! The Loire Valley, with its wide namesake river and many tributaries, spans a region of around 800 square kilometres (310 sq mi). The central part of this vast area, from Chalonnes-sur-Loire to Sully-sur-Loire, became a UNESCO World Heritage site anno 2000. The immense treasure of cultural wealth here has its feet firmly planted in a fertile landscape and in the cradle of French history. 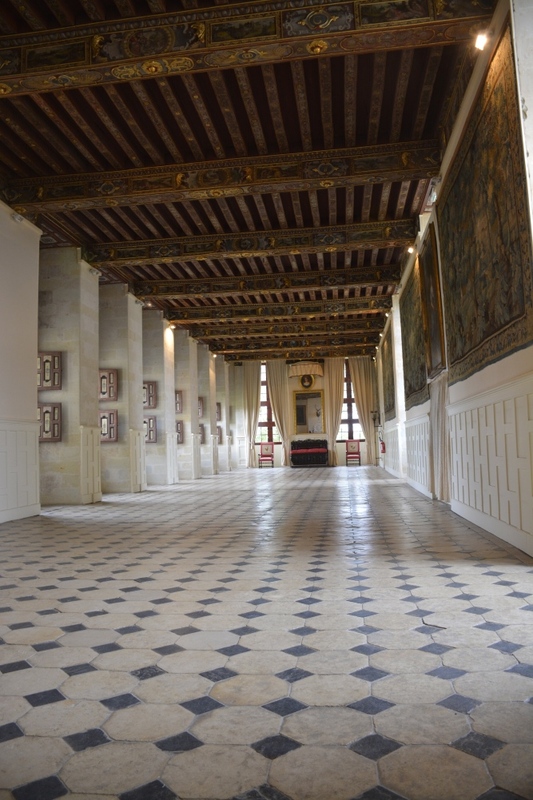 Of its 300 chateaux, 100 are open to the public, and 42 are located within the UNESCO site. This is great news! Castle-hopping to the Loire Valley in easy day trips from the Vendée is a top sightseeing activity. Like a lolly-pop among our already favourite candy!